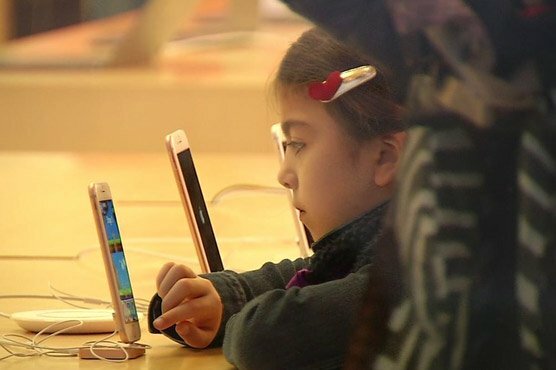 Two large shareholders urged Apple to study whether iPhones are proving addictive for children and that intensive use of the smartphones may be bad for their mental health. "There is a growing body of evidence that, for at least some of the most frequent young users, this may be having unintentional negative consequences" on their health, said Jana Partners LLC and California State Teachers' Retirement System (Calstrs) in a letter sent to Apple dated January 6 and made public Monday. The "growing societal unease" over the intensive use of smartphones by children is "at some point likely to impact even Apple," they warned. The two shareholders, which between them own about $2 billion in Apple shares, urged the company to develop additional means for parents to restrict the use of mobile phones by their children. "We specifically ask that Apple form a committee of experts and specialists to research and study this issue and monitor ongoing developments in technology," the letter said. "Additionally, we encourage Apple to offer parents more tools by enhancing mobile device software to enable age-appropriate setup options including limiting screen time, setting up parental monitoring, etc." The investors said confronting this issue now would enhance the value of the firm in the long term for all shareholders. Apple has not commented on the letter, but it provides parental controls on iPhones that allow restricting access to certain apps and content. Although Apple was singled out in the letter, the question of technology and screen time for children has long been debated. The investors cited a recent study by the Center on Media and Child Health and the University of Alberta, according to which teachers observed that students are negatively distracted by digital technologies in the classroom. In the study, three fourths of teachers said students' ability to focus on educational tasks has decreased. While it is not clear how many children use these devices, surveys indicate more than one billion smartphones are being sold each year. The letter represents a new source of pressure on Apple, after being forced to apologize last month for slowing down the performance of older iPhone models. Consumer groups had accused the tech giant of slowing down the older models to encourage purchase of newer models, but Apple said the move was meant to optimize performance of phones with older batteries and cut the price of replacing the battery.